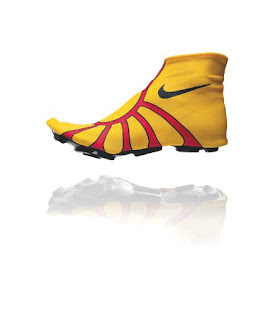 Nike has made their own version of the Sand Sock for Beijing beach volleyball Olympians, the Zesti. Of course, they had to get all artsy and make it look goofy as hell. In addition to protecting your feet on hot sand, the Zesti supposedly gives you more grip on the sand, if that's possible. I think you'd need some several-inch metal spikes for that. If you're one of those people that likes to look at photos of yourself 10 years ago and ask, "God, what was I thinking?" then this is the sand shoe for you. Crocs people, you know what I'm talking about.